Use National flag on land. Design A green and red bicolor with an ornamental pattern charged at the hoist. 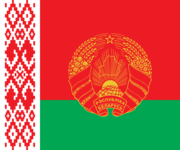 The current national flag of Belarus was formally changed on June 7, 1995, following the result of a referendum voted on by the Belarusian people in the previous month. This new design replaced a historical flag used by the Belarusian People's Republic of 1918, before Belarus became a Soviet Republic, and again after it regained its independence in 1991. The current flag is a modification of the 1951 flag used while the country was a republic of the Soviet Union. The 1995 flag has been the basis of several flags used by government bodies. A few groups have continued to use the previous flag, though its display in Belarus has been restricted by the government of president Alexander Lukashenko. The 1991 flag is still used in protests against the government and by the Belarusan diaspora. International independent observers have said that the referendum that selected the current flag did not meet democratic standards. is a rectangular cloth consisting of two longitudinal stripes: red upper stripe and green lower stripe that are two-thirds and one-third of the flag width respectively. A vertical red-on-white Belarusian decorative pattern, which occupies one-ninth of the flag's length, is placed against the flagstaff. The flag’s ratio of width to length is 1:2. The flag is fixed on a flagstaff painted golden (ochre). The flag does not differ significantly from the flag of the Byelorussian SSR, other than the removal of the hammer and sickle and the red star, and the reversal of red and white in the hoist pattern. The only thing that was not mentioned in the decree is the width of the red ornament pattern in the white strip. One suggestion that was given is that the width of the red ornament is 1/12th of the width of the flag. The red color of the flag signifies the past history of Belarus, as the colour used by the Belarusian forces at the Battle of Grunwald, and of the Red Army when they were fighting Nazi Germany during World War II. Green stands for the bright future ahead of Belarus, and also represents the many forests located in the country. While the colors of the flag are red, green, and white, the exact shades have not been determined by either law or decree. Several websites and publications, such as the Flags of the World and Album des pavillons nationaux et des marques distinctives, have estimated the colour shades in either the Pantone colour scheme, or as CMYK colour model or RGB values. There is a decorative pattern displayed on the hoist of the flag (and previously on the 1951 flag). Designed in 1917 by Matrena Markevich, the pattern is commonly used in Belarus to show local plants and flowers. These patterns are also woven into outfits, and also used for a traditional woven craft called rushniks. Rushniks are traditional towels decorated with the ornamental pattern that are used for ceremonial events. An example of their use would be a host offering his guests bread and salt, which would then be served on a rushnik. Rushniks are also used at religious services, funerals, and other social functions. On the current flag, the ornamentation is used to symbolize the cultural past, and the unity of the Belarusian people. A flag finial is an ornament that is placed on top of the flagstaff as a piece of decoration. Belarusian law states that if the flag is used by government bodies for certain occasions, such as ceremonies and other solemn events, the Belarusian flag is to use a finial. The finial is shaped like a diamond, and at the bottom portion of the finial is a gold star. The star, according to law, has five points and must be of the same design as the one in the Belarusian coat of arms. The entire finial is of a golden colour with a golden shaft where the pole can be slid into the base of the finial. If the flag belongs to a military organization, ribbons can be placed on this golden shaft. The finial is similar in design to that previously used with the Soviet flag, except that the Soviet-era finial was silver-colored and had a hammer and sickle and star placed in the cut area. The flag is also displayed on vehicles used by Belarusian diplomats and various government officials (such as the President and the Prime Minister). The law allows for the flag to be used for special occasions, such as memorial services, and family holidays, and it can be used by various groups of people, such as public organizations, companies, and NGOs. The regulations were issued in the same decree that created the Belarusian flag. May 15 has been declared the Day of the National Emblem and Flag of Belarus (День Государственного герба и Государственного флага Республики Беларусь). The national flag itself has been incorporated into the badge of the guard units in the Belarusian armed forces. The flag of the Byelorussian Soviet Socialist Republic was adopted by decree on 25 December 1951. The flag had a length to width ratio of one to two (1:2), just like the flag of the Soviet Union (and the other fourteen union republics). The main portion of the flag was red (representing the Revolution), with the rest being green (representing the Belarusian forests). A pattern of white drawn on red decorated the hoist portion of the flag; this design is often used on Belarusian traditional costumes. In the upper corner of the flag, in the red portion, a gold hammer and sickle was added, with a red star outlined in gold above it. The hammer represented the worker, and the sickle the peasant; according to Soviet ideology, these two symbols crossed together symbolized co-operation between the two classes. The red star, a symbol commonly used by Communist parties, was said to stand either for the five social groups (workers, youth, peasants, military, and academics), the five known continents, or the five fingers of the worker's hand. The hammer, sickle and star were sometimes not displayed on the reverse of the flag. Before 1951, several different flags had been in use since the Revolution. The earliest flag was plain red, and was used in 1919 during the existence of the Lithuanian-Byelorussian SSR. After the formation of the Byelorussian SSR, the lettering ССРБ (SSRB) was added in gold to the top hoist. This design was changed in 1937, when a hammer and sickle and red star were placed above the letters; at the same time, the typeface was changed, and the text of the lettering was altered to БССР (BSSR). During the 1940s, the hammer and sickle and red star were removed from the flag, and a gold border was added to the letters. This flag remained in use until the adoption of the 1951 flag. The flag used between 1991 and 1995 had originally been devised by the Belarusian People's Republic (March to December 1918). The colors of flag were based on those of the Republic's coat of arms, which had a white horseman on a red background, and allude to the name of the country: White Russia ( White Ruthenia). This flag design is known in Belarusian as the Бел-чырвона-белы сьцяг (bieł-čyrvona-bieły ściah). The historical origin of this flag's design are not known, but two theories have been presented. One theory is that the banner was designed simply to distinguish the forces of the White Rus from those of the Princes of Kiev and Muscovy. This was done by placing the colour red, which the Rus preferred, on a background of white. Another theory, which is also the traditional explanation, is that in 1410, when the united armies of Poland and the Grand Duchy of Lithuania, defeated the Germans of the Teutonic Order at the Battle of Grunwald. According to this tradition, a wounded Belarusian knight tore off a blood soaked bandage and raised it as a banner of victory. Variations of this flag were used during the Belarusian People's Republic. Lasting from 1919 until 1925, the flag of the BPR retained white, red, white design, but with the addition of black stripes at the top and bottom of the red stripe. This flag was also used by collaborators during the Nazi occupation of Belarus, and it appeared on arm patches of Belarusian volunteers in the German Army and Waffen SS. From 1991 until the controversial referendum in 1995, the white-red-white flag was used as the national flag. However, despite the adoption of new national symbols after the referendum, the flag has continued to be used both inside and outside of Belarus. Currently, the flag is often used as a symbol of protest against President Lukashenko's government. However, any display of the flag in Belarus is usually removed by local police. Those who use the flag, such as activist Khristina Shatikova, were beaten by the police and fined using the flag in Vitebsk. Some of the groups using this flag as a protest include Zubr and the Belarusian Popular Front. The official reason for outlawing the white-red-white flag is that the symbol was used by the Nazi collaborators during the World War II. .
Also, the 1991 flag made an appearance in a video game relating to the 1998 Winter Olympics ice hockey tournament. The flag was used on the uniforms of the Belarusian hockey players and was used as a banner image behind the players during the playing of the national anthems. In a bit of irony, the anthem that was paired with the flag was the Hymn of the Soviet Union. The referendum that was held to adopt the state symbols took place on May 14, 1995. With a voter turnout of 64.7%, the new flag was approved by a ratio of three to one (75.1% to 24.9%). The other three questions were also passed by the voters. The way of carrying out the referendum was heavily criticized by the opposition. Also, actually only 48.6% of the total electorate approved of the new emblem, since over a third of the eligible voters did not express an opinion. Some claim that this failure to win a majority is a violation of the Law, but the imperfection and incompleteness of the Belarusian Law cannot resolve the issue. President Lukashenko had tried to hold a similar referendum before, in 1993, but failed to get parliamentary support. Two months before the May 1995 referendum, Lukashenko proposed a flag design that consisted of two small bars of green and one wide bar of red. While it is not known what became of this suggestion, new designs (called "projects" in Belarus) were suggested a few days later, which were then put up to vote in the 1995 referendum. President Lukashenko has adopted a standard for his personal use. The standard, which has been in use since 1997, was adopted by a decree called "Concerning the Standard of the President of Republic of Belarus". The standard's design is an exact copy of the Belarusian flag, with the addition of the Belarusian coat of arms in the centre. The arms, which are five-sixths of the standard's length, are colored in red and outlined in gold. 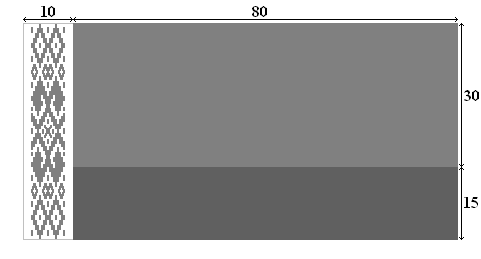 The standard's ratio (5:6) differs from that of the national flag, making the standard almost square. It is used at buildings and on vehicles to denote the presence of the president. In 2001, President Lukashenko issued a decree granting a flag to the Armed Forces of Belarus. The flag, which has a ratio of 1:1.7, has the national ornamental pattern along the length of the hoist side of the flag. On the front of the flag is the Belarusian coat of arms, with the wording УЗБРОЕНЫЯ СІЛЫ ("Armed Forces") arched over it, and РЭСПУБЛІКІ БЕЛАРУСЬ ("Republic of Belarus") written below; the text of both is in gold. On the reverse of the flag, the centre contains the symbol of the armed forces, which is a red star surrounded by a wreath of oak and laurel. Above the symbol is the phrase ЗА НАШУ РАДЗІМУ ("For our Motherland"), while below is the full name of the military unit.